About a year ago, recipes for sparkling cranberries started circling the food-blogosphere. As a cranberry lover I was excited to try them myself, but when I finally did, I had less than perfect results. All of the recipes I found had you soak the fresh cranberries overnight in a sugar syrup, drain them, and then toss them in granulated sugar. I found that the wet cranberries made a muddy mess in the sugar bowl, and I ended up wasting 4x the sugar than the recipe called for. In my version, I find the soak unnecessary and instead allow the syrup to dry on the cranberries before coating them in the dry sugar. The finished cranberries are glitzy, glamoury and best of all, sweet'n sour and absolutely delicious. Serve them in a beautiful glass bowl as the centerpiece to a holiday cheese or dessert spread, or, as I often do, on a tray in doubled-up white paper baking cups. In a glass bowl combine 1/2 cup sugar and water. Microwave on high for 1 minute. Stir well until the sugar has dissolved. Depending on the strength of your microwave, it may take a couple more 1 minute intervals for the sugar to dissolve completely. Allow the syrup to cool to room temperature. Once cool, add the fresh cranberries to the syrup and gently toss until the cranberries are completely coated in syrup. Using a slotted spoon, drain off all excess syrup, and transfer the cranberries to a shallow dish in a single layer. Refridgerate the cranberries uncovered for 24-72 hours until dry and sticky. It helps to gently stir them every 12 hours to evenly distribute the sugar syrup. 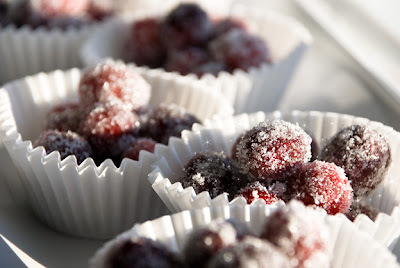 Once dry and sticky, add the cranberries to a bowl with the remaining 1/2 cup granulated white sugar and toss until they are completely coated. Using your hands or a slotted spoon, remove the cranberries from the bowl leaving any excess sugar behind. They are ready to be served, or you can refrigerate them for up to a week (exact storage time depends on how fresh your cranberries were when you began). Not only do they look delicious, they look beautiful! I was so happy to see something on your blog! Trying these now with the fresh cranberries I froze earlier on in the month. I've let them thaw for a few hours so hopefully it works as well. I am on a cranberry kick, so hopefully mine work out as well!